so I guess i must me having a blast lol! Instructions: Card size is 5 1/2 x 4 1/4”. 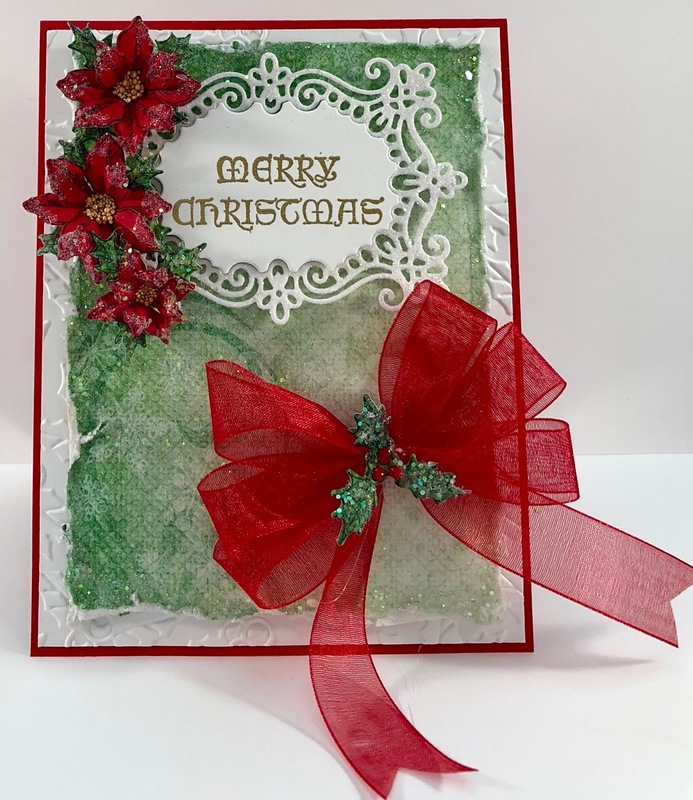 Cut red cardstock 4 1/4 x 11”, score and fold at 5 1/2 inches to create an A2 tent fold card base. Cut white cardstock 5 3/8 x 4 1/8” and emboss using a holly or other Christmas themed embossing folder. 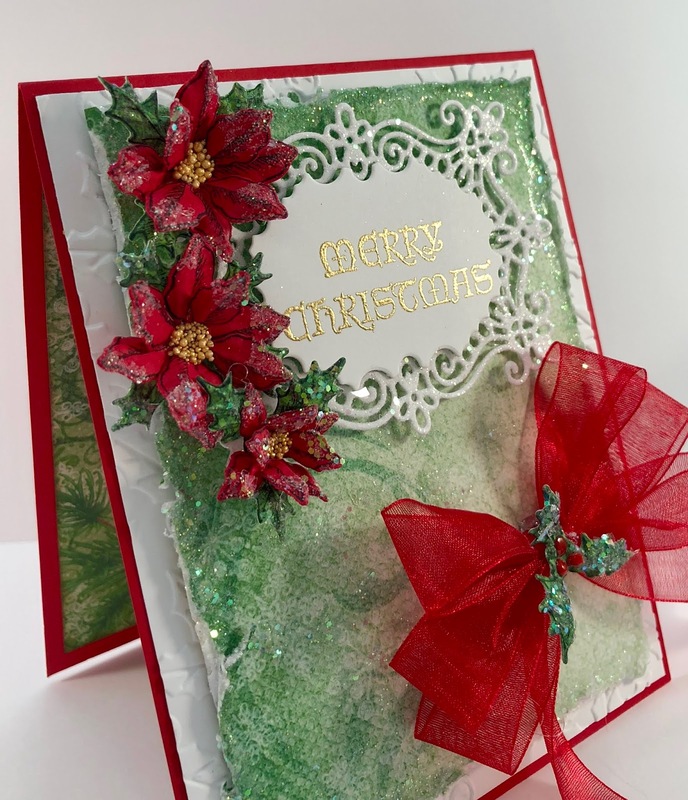 Adhere to card base using dries clear adhesive. Cut a piece of green paper from the O Holy Night paper collection 5 1/8 x 3 3/4”, distress the edges and adhere to card base using dimensional dots. Sponge the edges with glue and sprinkle with Rajni Chawla’s crystal clear glitter. Randomly sponge and glitter the design on the paper. Cut another piece of the green designer paper 5 x 4” and adhere to the inside of the card. Stamp the Poinsettias on red cardstock using Archival Jet Black ink and diecut using the coordinating die. Stamp the leaves on green designer paper and diecut using the coordinating die. 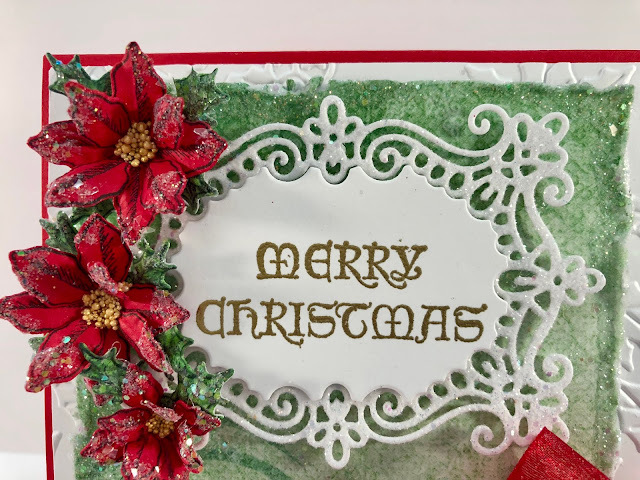 Place the flowers and leaves in the Poinsettia shaping mold, spritz with water and run through the die cutting machine. Press the centers of the flowers down using the Deluxe Flower Shaping Kit. When dry, glue two petals together, adhere to the leaves, sponge with dries clear adhesive and add Rajni Chawla’s Crystal clear and glass glitter. Add dries clear to the centers and sprinkle with Heart of Gold Prills. 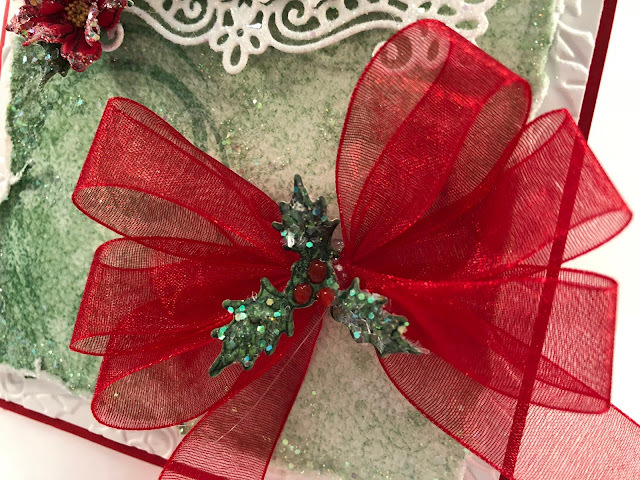 Add red berry crystal drops to one of the holly leaves. Please check out the Heartfelt Creations Blog. The awesome design team has some really beautiful projects this week. Thank you once again for stopping by...I so appreciate you! Just beautiful!! I love your bow - I have so many problems getting a gorgeous bow like yours! 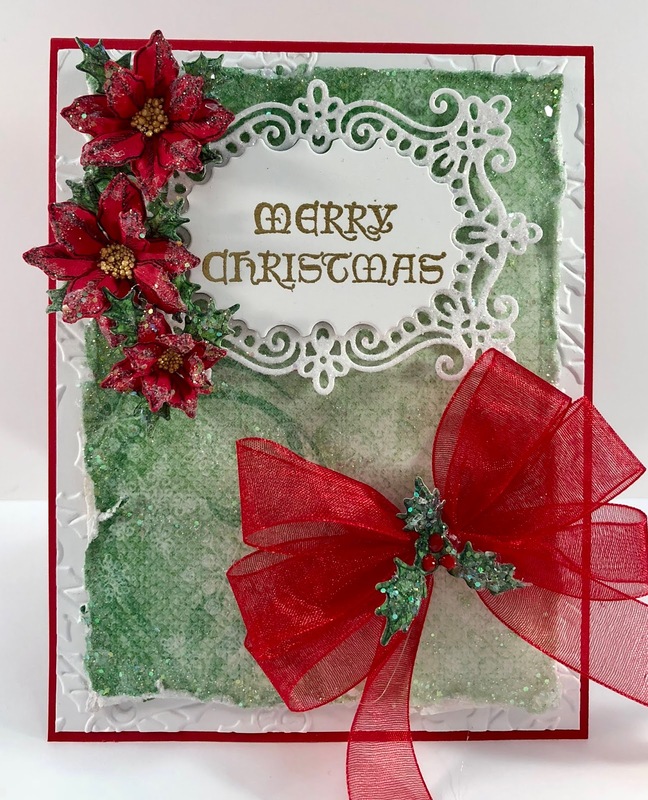 Such a gorgeous Christmas card, I love your distressing and the embossed background peeking out, such a great detail! Beautiful Janet! I Love your big sheer bow and the poinsettias are so beautiful!